What are the various considerations when a first time home buyer sets out to search for a property? Is there a change in the mindset of the home buyers? The property market in India has seen a lot of action over the past decade. Rapid economic growth, easy availability of finance coupled with high disposable income has made many young Indians look favorably at a real estate investment. What are the various considerations when a first time home buyer sets out to search for a property? Is there a change in the mindset of the home buyers? 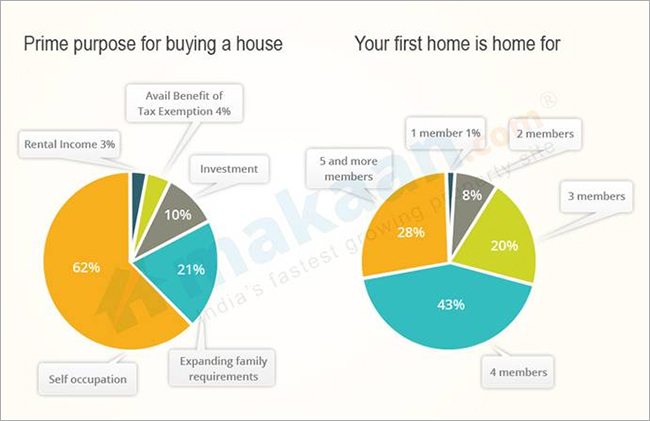 To understand this and many more questions related to the psyche of a first time home buyer, Makaan.com, the fastest growing real estate website in India, conducted a research christened “First Home Buyers Preference”. Our Participants: Our research saw a participation of 1511 first time home buyers from across the country including key cities of Mumbai, Delhi NCR, Bangalore, Chennai, Hyderabad, Pune, Kolkata, Ahmedabad, Chandigarh & others. Most of the research takers were male, in the age group of 28 -45 years. First time home buyers prefer ready to move in property over under construction properties: This can be considered as a paradigm shift as far as first time home buyers psyche is concerned. Not so long ago, people preferred to buy under construction properties as they were more affordable but now possession delay has forced people to consider ready to move in properties. Most of our respondents – 43% prefer to buy ready to move in properties whereas another sizable portion 35% has chosen to buy under-construction properties that are offering possession in two years time. Rest of the respondents will prefer to buy home will are offering homes after more than 2 years. Makaan's Take: Delays in project execution & litigation on under construction properties have made home buyers apt for ready to move in properties. Ready to move in flats have additional advantage in the form of rental saving and income tax deduction upto 2.0 lac p.a. on interest paid on home loan. The only concern with Ready to move in accommodations is that they are pitched at higher prices in comparison to under construction properties. 2. Price and Location are two most important purchase consideration for first time home buyers: Budget and prime location and bare the two most important points that are considered by first time home buyers. Our survey shows that “Price” stands the top purchase consideration with 42% respondents opting for it. Location comes second as 30% respondents consider this as an important point for buying any property. 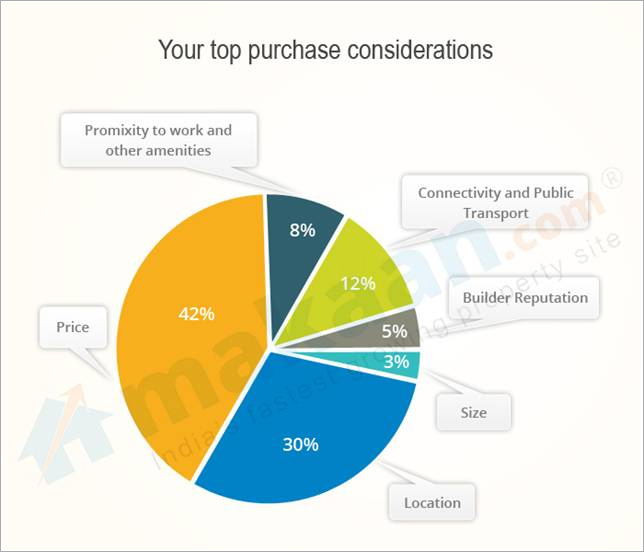 Other considerations were Connectivity to public transport 12%, Proximity to work and other amenities 8%, Builder Reputation 5% and Size 3%. Makaan.com’s take: Home buyers want to find their dream adobe closer to their preferred location in their limited budget. It is quite evident from the fact that over the past decade areas that are well connected and are located at prime locations tend to appreciate more compared with other areas within the same city. First time buyers prefer to buy a flat or apartment. First time Home Buyers start exploring for property options with a million dreams nurtured within. Their preferences give shape to their first home, whether they should go for a villa, apartment, studio apartment, or a builder floor. 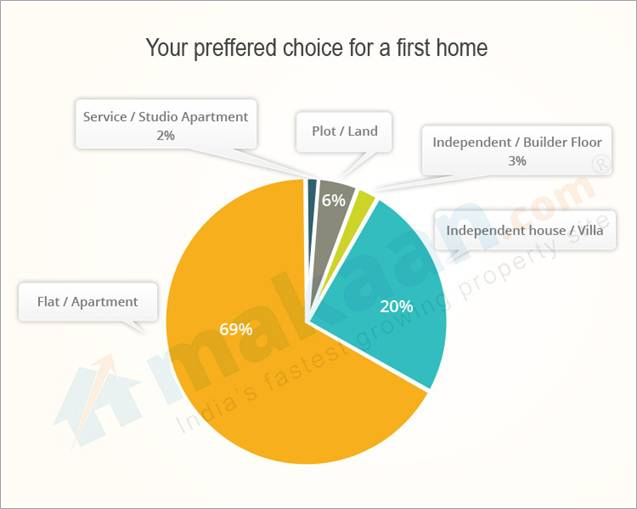 We asked the respondents about their preferred choice for a first home. Whopping 69% respondents preferred Flats/Apartments, followed by Independent houses or Villas, which was favorite for 20% of the respondents. Independent / builder floor, Plot/Land and Service / Studio Apartment were other options in the list which were favored by 3%, 6% and 2% respectively. The preference for an apartment is typically an urban phenomenon and reflects the sentiments of home buyers living in tier 1 & 2 cities in India. This could be because of the security and community living benefits that only an apartment can offer. Outside of tier 1 & 2 cities, India is predominantly a low density environment where the preference will differ from the above. 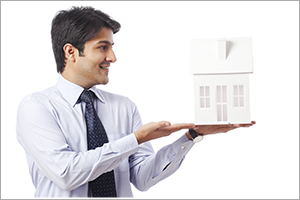 People buy homes for various reasons like self occupation, for investment or earning rental income. We discovered that most of our respondents wanted to buy home for self occupation, this means most of the people do not prefer to stay in a rental property. More than 62% people said that the want to buy their first home for self occupation. Around 21% people wanted to buy a home for expanding family whereas 10% people bought first home for an investment purpose. Other options also included – Avail benefit of Tax Exemption and earning rental income both these options were selected by 4% people. In Indian context wherein family values, tradition and virtues are respected, a home buyer in India typically buys a house for a family. Our First Home Buyers bought their homes for a family consisting of 3-5 members. 43 % survey takers said they got their home for a family of four members while 28% of the respondents bought their home for 5 members. Home buyers who got home for 3 family members are 20% of the total respondents and those who bought home for 2 members constituted 8% of the total respondents. Only 1% got the home for themselves. Builders offer homes at the cheapest prices, also buying a home from a builder means that one will be the first owner of the home. Our survey shows that majority of the people prefer to buy home directly from the builder. 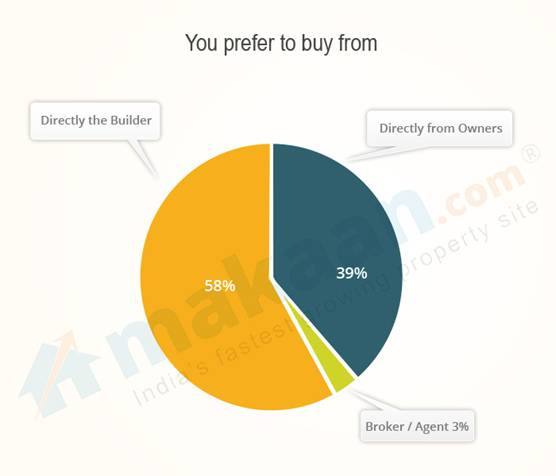 Around 58% of our respondents said that they prefer to buy properties directly from builder whereas around 39% prefer to buy from owners. Only 3 % people would like to buy a property from agent or a broker. Owning a house is a priority for most Indians today. Affordable housing i.e., housing under 30 lacs continues to be a preference for 52% Indians. We asked home buyers what they think the ideal budget is. Around 30% chose a budget between 30-50 lacs. Next on chart is a budget between 50-75 lacs with 11% of the respondents. 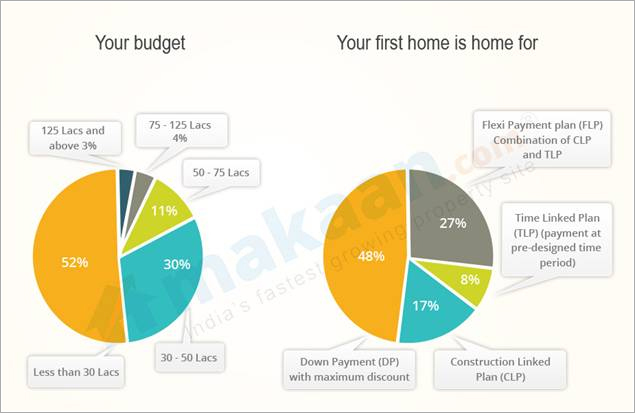 For 4% budget is 75- 125 lacs, whereas a budget of over 125 lac was preferred by only 3% home buyers. The research brings out the disparity in the demand – supply equation in the Indian cities. Whereas most Indian are looking for a home under 30 lac the availability is this price bracket is limited leaving demand far in excess of the supply. The supply in >125lac is huge where-as there is limited demand in this segment, leading to unsold inventory. Real estate developers and policy makers will have to come to grip with this mismatch and take corrective action to solve this issue. It is a general belief among real estate players that Construction Linked plan (CLP) is preferred by home buyers as it provides protection against construction and other delays. But our survey shows that most of the home buyers prefer a Down Payment (DP) plan as it comes with maximum discount. The research shows a whopping 48% inclination towards “Down Payment” plan. The urge for a discount is stronger than the security of a timely possession at least in case of a first time home buyer. In fact CLP is not even the second preference. Flexi Plan (FP) which is essentially a mix of Time Linked (TLP) & CLP is preferred by next 27% of home buyers. This plan also offers greater discount compared with CLP. The pseudo favorite Construction Linked Plan (CLP) is favored by just 17% home buyers whereas Time Linked Plan is preferred by only 8%. Real estate developers often offer schemes and offers in a bid to attract more and more customers but our research shows that most of the young buyers don't fall for schemes as they feel that they are just financial gimmicks. 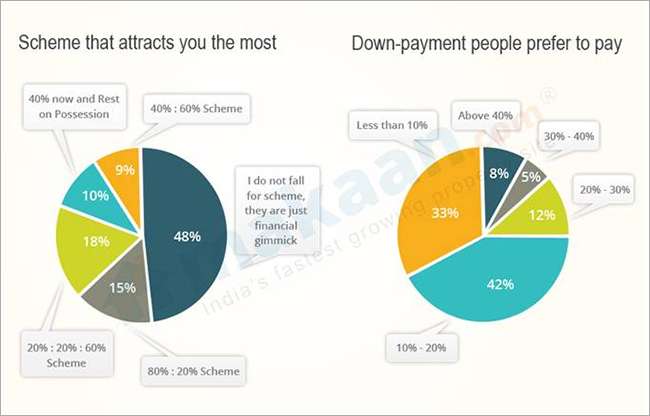 More than 48% of our respondents were not attract by schemes offer by real estate developers. The 20%: 20%: 60% Scheme attracted 18% whereas 80%: 20% scheme caught the attention of 15%, the 40%: 60% Scheme found 9% takers and 40% now and rest on possession managed to attract 10% people. Down payment is the first financial hurdle a buyer comes across in the home buying process. The research reveals that a first time home buyer can afford a down payment between 10-20% with 42.31% of the respondents opting for it. Next comes the scale of less than 10%, with 32.61% of the total respondents. Third on the chart is the scale of 20-30% with 12.21% respondents. Interestingly 8% respondents are willing to pay over 40% of the home cost as down payment.